Augusta residents will soon get to experience a treat that has been popular in Huntsville, Ala., for the last 44 years. 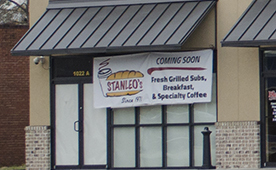 Stanleo’s subs will be opening an Augusta location by mid-February of this year at the corner of Walton Way and 11th Street. Jeff Whitehead, owner of the Augusta location and a family friend of Huntsville owner Connie Ward, has been working closely with the Huntsville location to learn how to replicate the popular sandwiches for the upcoming Augusta location. When Whitehead, a Lake Oconee resident, was looking at possible expansion locations in Georgia, he settled on Augusta due to its business-friendly climate. However, Whitehead will also be making a few changes to the original restaurant’s name and servings. The original Huntsville location, Stanlieo’s, was opened in 1971 by Ward’s father, Glenn Watson. Watson felt that the extra “i” gave the sub shop a more Italian feel. But it was easy to miss that small letter. “When people here spell the restaurant’s name, a lot of people tend to drop the ‘i’, so we gave Jeff permission to remove the ‘i’ for the Augusta location,” Ward said. In addition to the spelling change, Stanleo’s in Augusta will also add a few new items to the menu. Unlike the Huntsville location, the Augusta location will be offering breakfast sandwiches and blended coffee drinks. The Augusta location will have a drive-thru option as well. “The drive-thru will also be offering a few of our lunch sandwiches that are quicker to make, but not the full-blown menu,” Whitehead said. Stanleo’s is one of two new restaurants locating on that corner. Diablo’s Southwest Grill is next door in the same building.